Twelve months ago Bill released “The Wild Radish Song” to raise awareness of herbicide resistance. This week he has released his next song “Carbon Resolution”. The song aims to encourage advisers and farmers to have a conversation about how farmers can reduce green house emissions and slow global warming. The lyrics address the small changes farmers can all make, that accumulatively as an industry, could have a big impact on emissions. This song has been a family affair in our house with son Will playing the lead guitar, daughter Alice putting the video together and Bill writing the lyrics, playing acoustic guitar and singing. It was inspired by John Butlers Revolution. We have also embarked on a social media campaign to promote the song with Alice running a Facebook page, tweeting and releasing videos of Bill talking about the video in the two week lead up to the release. The Facebook page www.facebook.com/TheLongPaddockProductions reach over 300 likes in the first week. As a social media extension experiment we are looking forward to seeing how far and wide the song will go. After nearly 12 months the Wild Radish Song has reached over 24000 with Bill receiving emails from across the world. The song has been produced as part of a Carbon Extension and Outreach program to raise awareness about the agricultural sectors impact on climate change funded by the Australian Government. The Building Farmer and Advisor Knowledge in Carbon Farming Project aims to train farm advisers and improve their understanding of carbon farming. Please share this with your friends and industry colleagues to raise awareness of carbon farming and to see how powerful social media and song can be as an extension tool! Send us your thought too. I have recently taken on the role of President of the Australasia Pacific Extension Network (APEN) and I am often asked what does extension mean. Extension is a word commonly used in agriculture and natural resources management but not often used elsewhere. APEN defines extension as working with people in a community to facilitate change in an environment that has social, economic and technical complexity. This is achieved by helping people gain knowledge and confidence so they see the need for change and provide support to ensure it is implemented effectively. APEN goes on to say that an important part of extension is capacity building. A recent paper published by the Australian Farm Institute defines Extension as – activities by both the public and private sector to transfer knowledge to and between farmers about ways to improve farm productivity and sustainability. The knowledge may be transferred either directly to farmers, or indirectly through farm service providers. Traditionally extension was seen as a transfer of knowledge, what I like about the APEN definition is it highlights the importance of people and capacity building. People make change and adopt new practices based on the information they receive and how well that data fits with their personal values, beliefs and attitudes. Without a good understanding of people, decision making processes and the impact of change data alone can pile up on the desk. 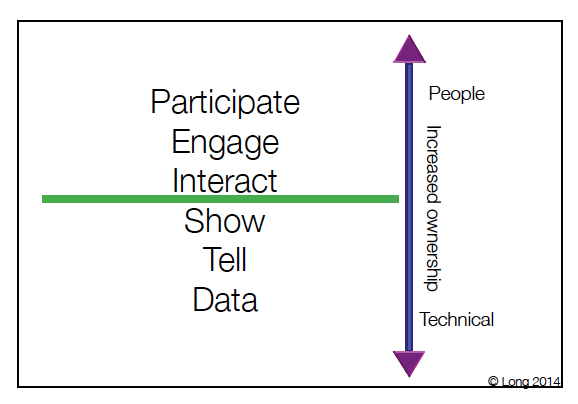 As the model suggests the extension process is about people and technical information. To ensure the research and development carried out on farmers behalf is adopted farmers it is best to engaged them in the process. This enables ownership and understanding to be developed throughout the research rather than data being provided at the end. If the data has been generated in relative isolation from a farmer audience then the people working in extension need to think about how they can engage farmers with the data to help them develop that ownership. Let’s become more creative in our methods – add some marketing and basic psychology skills to our extension practices.